The keynote address was what I was looking most forward to about the conference. It was given by Jan Shipps, whose masterful works on Mormonism I’ve quoted countless times in my own scholarship. Dr. Shipps spoke on the role the Book of Mormon played in early Mormon conversion, with particular attention to how our focus today on Joseph Smith’s prophetical calling tends to overshadow that role and obscure our understanding of how early Mormons experienced and the Restoration. (I live-tweeted the entire talk, so if you are interested in the talk, I recommend checking out my Twitter feed.) While all of the talk was excellent, my favorite parts came when Dr. Shipps would look up from her paper and share insights or reminiscences of her many years working with greats like Leonard Arrington. Following Dr. Shipps talk, the conference split into two concurrent sessions. I remained in the classroom to hear William Shepard talk about his new book Lost Apostles: Forgotten Members of Mormonism’s Original Quorum of the Twelve published by Signature Books. This presentation briefly addressed the issues six original members of the Quorum of the Twelve had with Joseph Smith, particularly over his involvement in temporal affairs like the Kirtland Safety Society and other businesses. What struck me most about the history given in this presentation was the relative youth of everyone involved. Joseph Smith, for example, was younger than me when he led the Saints in Kirtland, and Thomas B. Marsh, the president of the quorum, wasn’t yet forty. No wonder there was so much drama. My presentation on The Garden of Enid came next. (Another presentation, given by Jessica and Tom Kimball, was concurrent with mine.) I was assigned to speak in the Visitors Center chapel, which was decorated with colorful hand-woven wall hangings, candles, and an artificial waterfall. I had prepared an image-heavy presentation, so I had my laptop hooked up to a big-screen TV to project my PowerPoint to an audience of about ten people. Usually, when I give a presentation, I like to read directly from a paper. For this talk, however, I spoke more-or-less off-the-cuff, using my PowerPoint as an outline. (If you’re interested in viewing the PowerPoint, shoot me an email. I’ll send it to you.) I began by introducing the comic followed by an overview of its influences, cast, format, features, themes, and reader reactions. Most in the audience had not heard of the comic, so it was fun to see them react to my work for the first time. I spoke at length about the comic as my effort to apply the notion of the “radical middle” to Mormon creative expression and do with Mormon comics what others, like Steve Peck and Theric Jepson, have done with Mormon fiction. I also spoke a bit about my rather lofty hope that The Garden of Enid will be successful in bringing varieties of Mormons together. 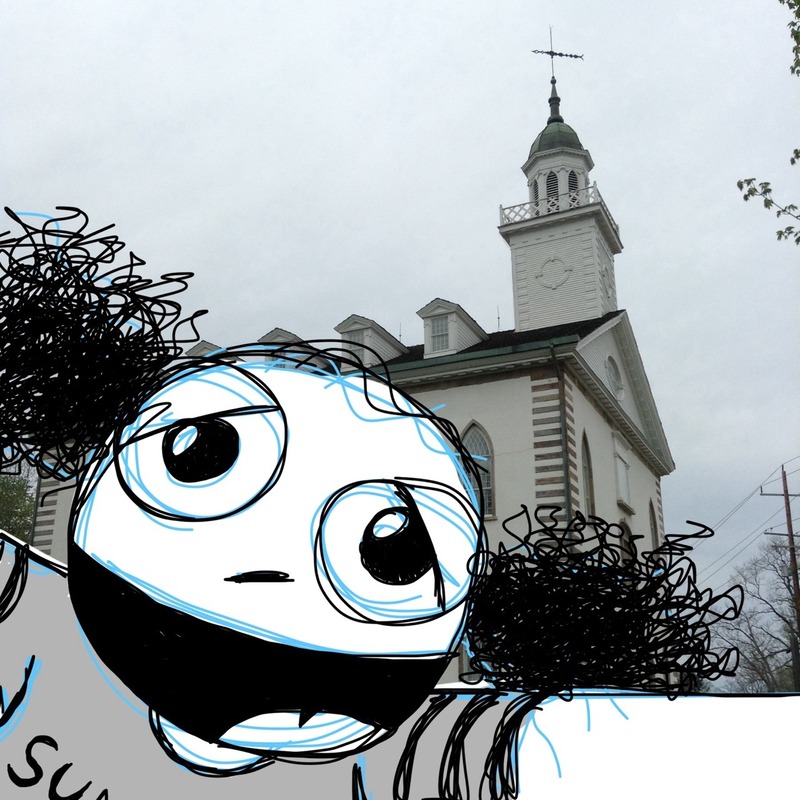 After my presentation, I had to head home–but not before I took a tour of the Kirtland Temple. I’ve taken this tour a number of times, but this was the first opportunity I had to see the third floor of the temple, which is often omitted from the tour. Of course, not much is on the third floor except for the bare space where Joseph Smith kept his office. Still, the weight of history is in that place and it is not hard to imagine the early Saints fillings its halls to receive instruction and knowledge. Overall, Sunstone Kirtland 2014 was a great experience for me. I enjoyed hearing the talks and meeting a few Enid fans. (Several attendees had just learned about the comic from Jana Riess’ Q&A with me on Flunking Sainthood, which had appeared the day before the conference.) Unfortunately, because I had to get home, I was not able to attend later conference sessions, but I hope to return next year and stay for the duration of the conference. If you live in the area, it is definitely worth your time. I’ve never been to the Salt Lake symposium and I have to admit I’m fold of the small vibe of these outlying events. Scott: I don’t subscribe to Sunstone — were the cartoons they published Enid-related?